A.M. CYCLE Calling all early birds. Start your day off with a 45-minute morning bike ride using a stationary cycle. Awaken and meet the challenge of sprints, hills, and jumps and feel rejuvenated for the rest of your day! Beginners are still welcome just like our traditional cycling and are encouraged to work at their own pace. Please arrive on time to set up your bike. A water bottle and a small towel are helpful for this class. ASHTANGA YOGA & MEDITATION Ashtanga Yoga is a physically challenging style of yoga that consists of an unvarying sequence of poses for strength, balance, and ﬂexibility. Building functional strength and endurance with detail orientated poses, and correct alignment all connected with a special breathing technique. This 90 minute class is followed by guided meditation. STRETCH, STRENGTH, CORE What are you looking for in a class? Do you want to look better? Do you want to be stronger? Or perform better in sports or leisure activities? For many of us, it is all of the above. This 30-minute class will leave you feeling rejuvenated and empowered by infusing strength training and yoga moves into one full body routine. BOOT CAMP EXPRESS This 30 minute class is designed to bring traditional calisthenics and body weight exercises with interval and strength training. We want to get you fit, get you healthy, challenge your mind, challenge your body, and most importantly MAKE FITNESS FUN! CARDIO BLAST Blast your cardio fitness level through the roof with the best of any type of cardio training the instructor feels like throwing at you! You will challenge your aerobic and anaerobic threshold every time, so come prepared to get your cardio on! This 30 minute class will be great for improving your personal best no matter what your goal is! MOVES AND GROOVESGet ready to work it old school! This 30-minute retro aerobics class is an upbeat, fat-burning cardio workout that is designed to kick start the metabolism and ignite your calorie burning potential through a unique combination of fun dance moves and toning exercise. So lace up your sneakers and get ready for the grapevine, jazz square, and the pony. DUATHLON This cycling class is designed for all fitness levels! Come bike, run, or walk in this duathlon inspired class. This 60-minute class offers diversity and a fun new challenge that will complement any workout program! FLOW YOGA Learning or relearning the state of unity, harmony, and bliss in the body, mind, and spirit through the adoption of specific bodily postures flowing from one to another. The cultivation of physical health will also be contributed to the breath control and meditation this class will offer in its 45-minute time span. HIIT Take your fitness to the next level with this 30 minute High Intensity Interval Training class. This interval-based class combines full-body strength training with high intensity cardio bursts designed to build cardiovascular fitness while improving strength, building lean muscle, and maximizing calorie burn. INDOOR CYCLING Using a stationary cycle, this cardio class will last for 60 minutes. Cycling builds endurance and trains leg muscles to be strong with no impact making it kinder to the knees and ankles. Beginners are encouraged to work at their own pace. Please arrive on time to set up your bike. A water bottle and a sweat towel are essential for success in this class. KETTLEBELL STRENGTH AND CARDIO Kettlebell training challengeS all muscle from grip to glutes. This heart-pumping class combines your favorite kettlebell strength and cardio moves into a whole-body workout. Kettlebell is for anybody who is looking to have fun while they exercise. The workout can be adjusted and moves modified to suit all individual needs. SENIOR BODY BAR This 60-minute class will follow the format of a gentle warm-up, low impact cardio exercises, and full body strength using barbell exercises. Body bar routines create the ability to build strength quickly and comfortably with the majority of work coming from exercises that involve multiple muscle groups at the same time with a padded bar. This class is for all fitness levels with our classroom barbell weight starting at 51bs and going to over 100lbs. 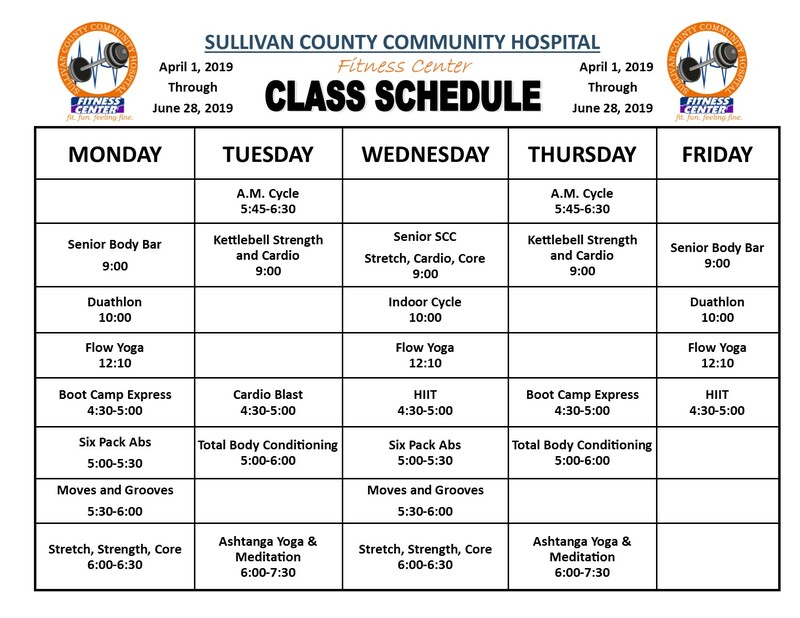 SENIOR SCC (STRETCH, CARDIO, CORE) This 45-minute class will consist of full body strength utilizing dumbbells, body bars, and your own body weight as well as core exercises to improving full body mobility and stability in activities of daily living. This class will finish off with restorative stretching that will heal the mind and body. SIX PACK ABS Our highly motivated instructor has created a belly-busting, torso-tautening routine that will sculpt a molded-in-steel midsection just in time for summer! This 30-minute class will burn abdominal fat fast and tone your midsection through a combination of high-intensity cardio movements, and make-it-burn ab, and lower back exercises. TOTAL BODY CONDITIONING This fun and challenging total body workout will test your strength and stamina while taking your conditioning to a whole new level. This class uses a variety of equipment including body bars, barbells, dumbbells, bands, stability balls, etc..